Australia has always experienced heat waves, and they are a normal part of most summers. However, the current event affecting much of inland Australia has definitely not been typical. The most significant thing about the recent heat has been its coverage across the continent, and its persistence. It is very unusual to have such widespread extreme temperatures — and have them persist for so long. On those two metrics alone, spatial extent and duration, the last two weeks surpasses the only previous analogue in the historical record (since 1910) – a two-week country-wide hot spell during the summer of 1972-1973. 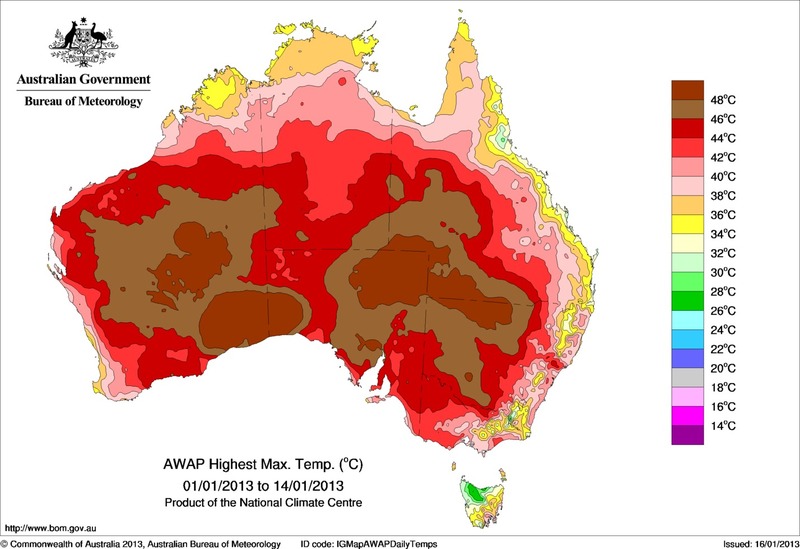 It is not that common for the Australian-average temperature to exceed 39°C for even two days in a row. A run of three days above 39°C has occurred on only three occasions, and a run of four days just once, in 1972. The current heat wave has seen a sequence of Australian temperatures above 39°C of seven days, and above 38°C of 11 days straight. Within the past decade, the number of extreme heat records in Australia has outnumbered extreme cold records by almost 3:1 for daytime maximum temperatures and 5:1 for night-time minimum temperature. Future warming of the climate due to greenhouse gas emissions will very likely lead to further increases in the frequency of unusually hot days and nights and continued declines in unusually cold days and nights. These changes will result in weather events which are increasingly beyond our prior experiences. Fick man inte användning för de nya färgerna det talades om i förra posten om Australien? Varför drar denna site alltid upp exempel på varmt väder men aldrig exempel på kallt väder? Regionalt väder har väl ingenting med den globala medeltemperaturen att göra? Hittar du motsvarande klimatologiskt intressanta extrema köldperioder över en hel region så säg bara till så ska vi ta upp den. Det här är inte bara varmt väder, det här är exceptionellt varmt väder under en längre period. Och Bureau of Meteorology kopplar det själva till klimatförändringarna. Dessutom innehåller inlägget en passus om värmerekord kontra köldrekord under en så lång tid som 10 år. Vilket, eftersom vi pratar om en så stor region, verkligen har med den globala klimatförändringen att göra. "Within the past decade, the number of extreme heat records in Australia has outnumbered extreme cold records by almost 3:1 for daytime maximum temperatures and 5:1 for night-time minimum temperature."